As a music therapist, I feel we have a responsibility to help advocate for those we serve, especially for individuals whose voices may not be heard often. We have a duty to empower our clients to share their story. There is nothing that brings us more pride than hearing a family share a success story about how music therapy has made an impact on their life. It is even more powerful when the person they have an opportunity to share their story with is able to retell their story in Madison to other decision makers. Helping our clients find opportunities to share their stories is pivotal in our efforts of expanding awareness of music therapy and its vital role in recovery, treatment, and maintenance of functional skills. 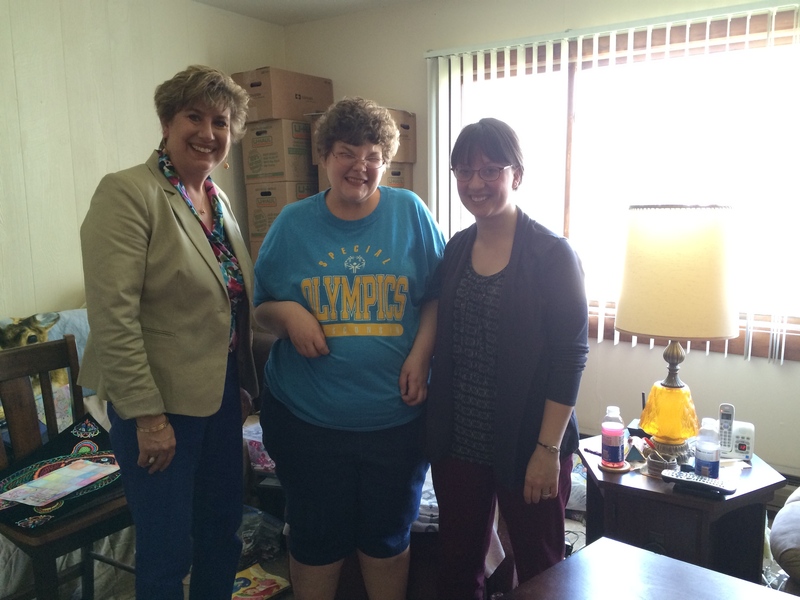 Angela working with music therapist, Andrea, to increase eye contact and social skills in the music therapy setting. 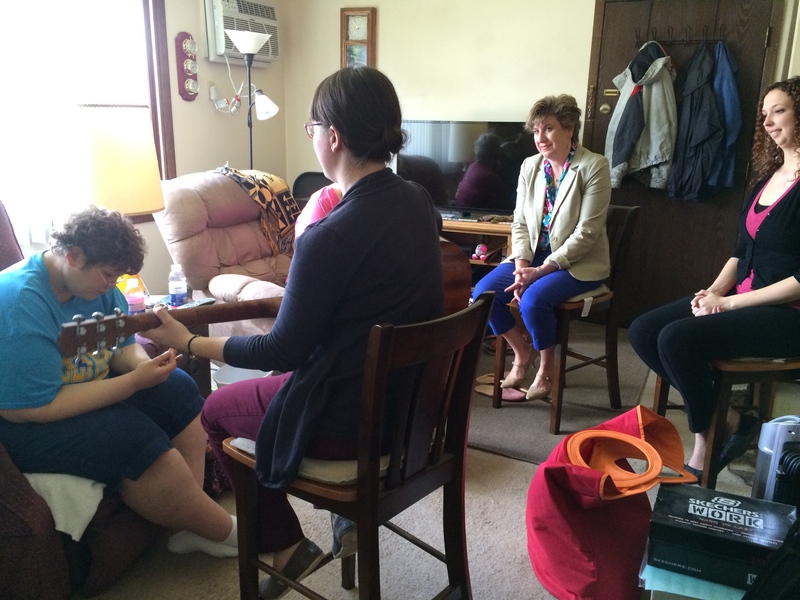 We wanted share how much we appreciate that two local political figures asked to join us in the field to learn more about how music therapy is impacting the lives of individuals with disabilities. 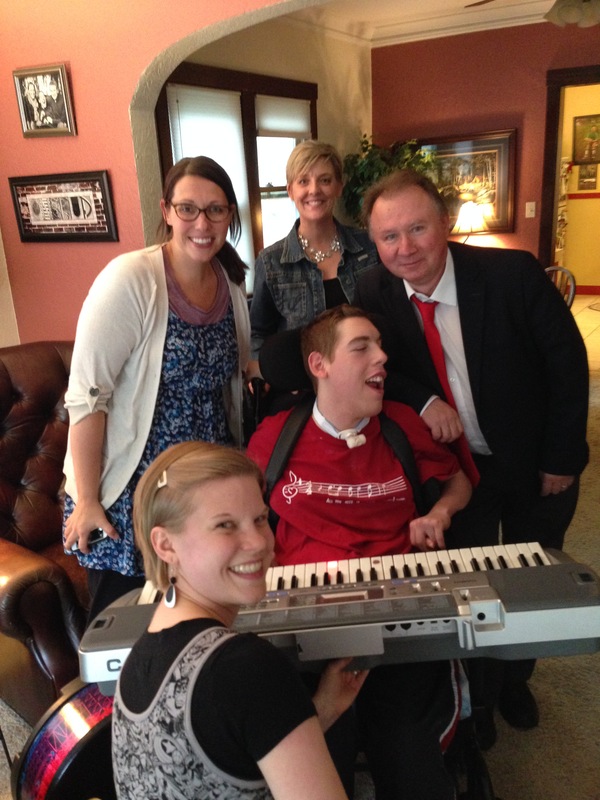 Senator Jennifer Shilling and Representative Steve Doyle went above and beyond to learn more about Life In Harmony Music Therapy, LLC and what LIH provides to individuals receiving services through Family Care and the IRIS program. It was such a great opportunity to show what services would be significantly impacted and likely eliminated if Governor Scott Walker’s proposed budget remains intact. We are so thankful for the time we had to share our passion for our profession and clients we serve. We were also very impressed by the willingness of both Senator Shilling, her staff member, and Representative Doyle for getting involved! This video highlights the use of the tone chimes to promote eye contact, awareness of others, and receptive skills of listening for one’s turn to play. 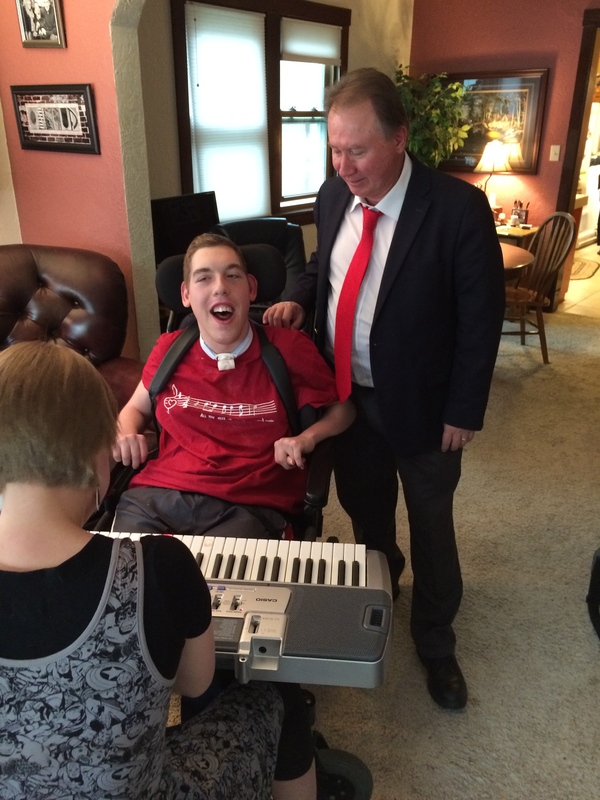 Many of our clients love to sing, hear, or play patriotic songs and there was no better song for Erik to perform for Representative Steve Doyle. While Erik played “America”, he had to work very hard at keeping his upper body relaxed to allow his arms to be accessible to reach the piano keys. When Erik hears patriotic songs he immediately becomes very excited, making self-relaxation even more challenging! With the support of Erik’s music therapist, Sarah Kolander, MT-BC, he did a fabulous job demonstrating what interventions are helpful for cognitive development, communication, and motor skills for an individual diagnosed with cerebral palsy. Having an opportunity to help others advocate for themselves makes me strongly appreciate we live in America where we have the freedom to have our voices heard! If you are a current client at LIH and you would like to have your story and voice heard, contact us today and we will help capture your story and share this with the decision makers in Madison. If you are a music therapist, please reach out to a local elected official to share the successes happening in your area! Angela was so proud to have Senator Shilling join her for her session! Erik and his advocacy team! Thank you for all you do! We love that Erik wore his shirt from his performance in the 2014 LIH Recital! 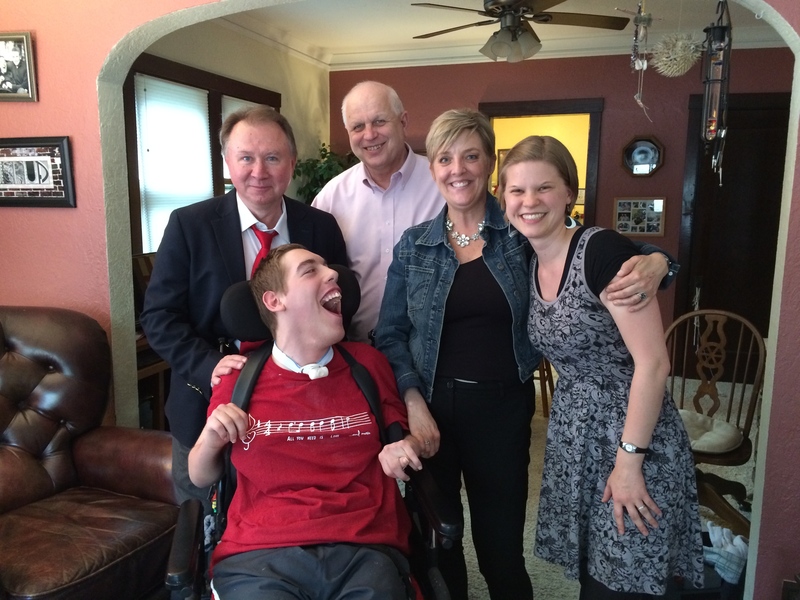 Thank you, Representative Steve Doyle for coming to see Erik shine! Thank you to Sarah, MT-BC for providing Erik with appropriate music interventions to foster success! 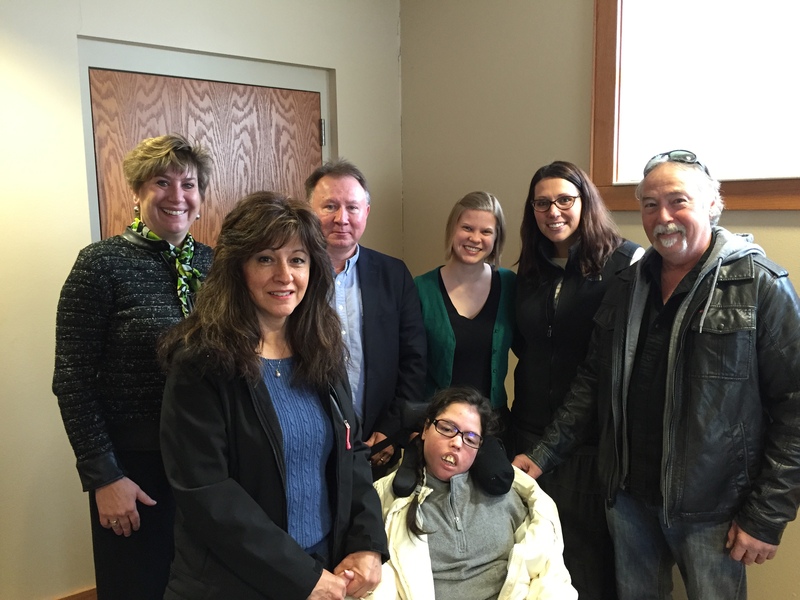 Adrianna and her family shared their story at a Budget Hearing Session in West Salem.